What is a mortgage title company? A title company is usually the last visit before obtaining ownership of a home and is commonly the location of a mortgage closing process. The process of closing a home purchase involves much more than simply signing some documents and obtaining the keys to the front door. Submitting a mortgage application and getting the application approved puts a whirlwind of activity into motion. Lenders must ensure the home is suitable for occupancy and that the home can legally be purchased from the seller. A stack of documentation is created and must be signed by the sellers and the buyers. Fees must be calculated and collected from the purchaser. Requests to transfer legal ownership must be filed and all of this must be done according to the regulations of the state and county. A title company works directly with the lender in order to ensure all documentation is valid and correct, and then in turn ensures the seller and buyer signs everything as needed. While a stack of mortgage documents may seem daunting and confusing to a first time home buyer, title company professionals are well-versed in why each document is needed and why these documents need to be signed. As a result, title company representatives can be great resources when questions arise regarding mortgage documents, but it is important to remember that title companies are not direct representatives of mortgage lenders. If something is wrong with the mortgage documents, it is the lender who will need to fix the error; the title company representative sends the paperwork back and requests the fix. 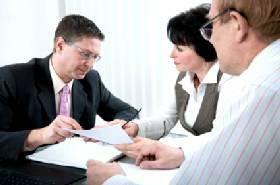 Mortgage title companies assume the role as liaison between buyer and lender in an indirect way. The sole intent of a title company is not necessarily to ensure that a home buyer has a smooth closing, but instead to make sure that all documentation is correct and legal, and that the home's title is clear. Every home should have a title that designates the legal owner of the property. This is particularly important when it comes to buying and selling home because if a person's name is not listed on a home title, then that person is not legally allowed to sell the property. If the sale goes through nonetheless, the new owner will probably soon discover that there is another owner, or perhaps liens or delinquent taxes that can dramatically change the circumstances of ownership of the home. What is a mortgage title company? These companies search the title history of homes to make sure there are no other people or entities entitled to ownership of the home besides the current owners. Title companies also make sure that there are no easements that have not yet been revealed by the sellers, such as a county road along the outskirts of the property or a restriction for use placed on portions of the property as the result of a county conservation effort. While certain easements will not necessarily restrict a home from being sold, it is important for buyers to understand the particulars of the easement. A title search will reveal these situations. Title companies issue title insurance policies, which guarantee that a home's title is clear beyond what it revealed from the title search. A title insurance policy is an important policy to have; if a person or entity later makes valid claim to the home, or portions of the property, the title insurance policy protects the buyer from any monetary losses incurred as a result. While some lenders recommend specific companies, oftentimes you will be on your own for choosing a title company. Keep in mind that title company fees can vary, so shopping around for the best prices -while also selecting a company with a good reputation- is important.